Just one point separated the protagonists after a roller coaster afternoon of heroism and heartbreak. But that solitary point left Carlow and Offaly galaxies apart as the final whistle sounded to condemn the traumatised hosts to life outside the Allianz League elite next spring. 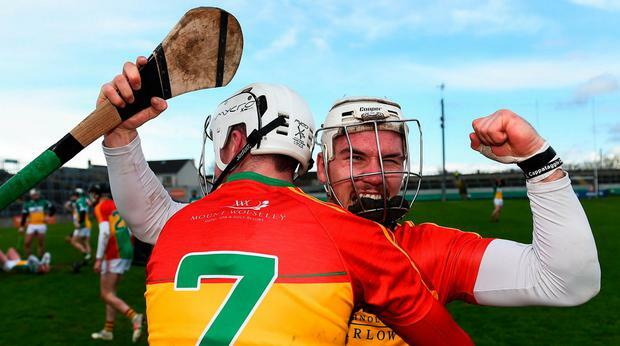 For Carlow this was a cause of rightful celebration, not just because they avoided demotion or secured their first away victory in top-flight league hurling, but because of the circumstances. A man down from the 10th minute after Edward Byrne's red card, and 11 points adrift at the break after electing to play into the teeth of a Tullamore gale, they fought like demons to find a way to safety. Yet the flip side is that yesterday was more a story of Offaly's ongoing descent than a tale of Carlow triumph. Last summer they were relegated from the Leinster SHC; now they find themselves outside the league's top-12 for the first time since 2005. Twenty-one years after Kevin Martin won his second All Star while helping Offaly to their fourth All-Ireland title, the Faithful's current manager is left to pick up the pieces. "It is not where any of us want to be and at half-time it certainly didn't look like we were going to be there," Martin admitted. "Today is very hard to take, but it is what it is. We tried but we got turned over. "We are not going to be whingeing and moaning about it. There will be no blame game," he insisted. All the while, Carlow have been moving in the opposite direction: taking Offaly's place in Leinster this summer and now this, a week after losing to them on home turf. Officially this was a relegation play-off but, as manager Colm Bonnar remarked: "It really is like a promotion. If anything, it nearly surpasses anything that we've done so far in terms of going up. Some of those players in the dressing-room have hurled for the last eight, nine, 10 years. They really set their stall out at the start of the year, that this was a goal they had to achieve. "Even their talk at half-time, they just couldn't fathom it, they couldn't face into going back training next November if they had to go back down to Division 2. So, there was huge pressure on everyone. 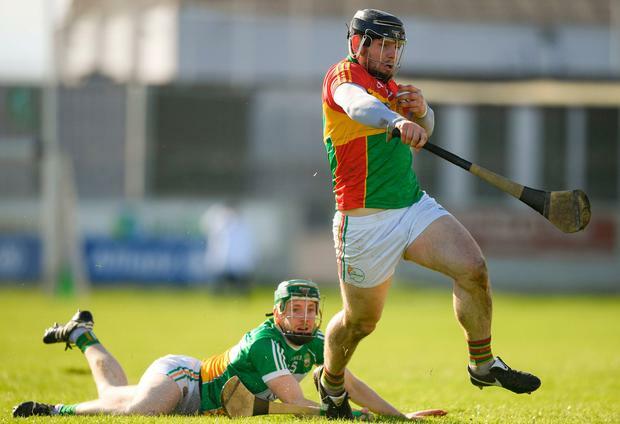 There was huge pressure on Offaly too." Ultimately that pressure was splattered over Offaly's error-strewn second-half performance, especially following the concession of two identical goals whose genesis was long deliveries into the goalmouth. Séamus Murphy hit the net two minutes after half-time; the livewire Chris Nolan got the second, just four minutes later. "We made some basic errors, communication wasn't there the way it should be there and, frankly, we just panicked," Martin later admitted. 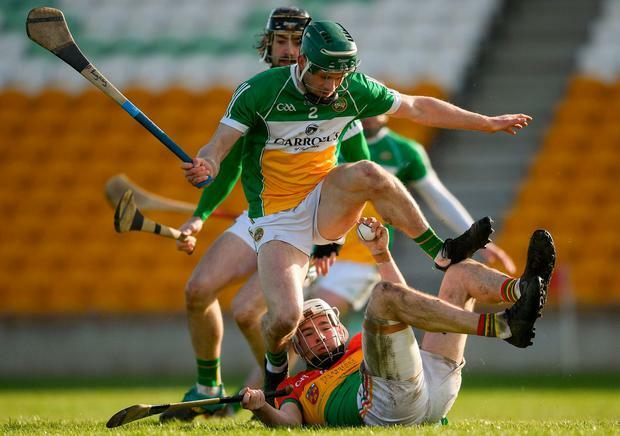 It had all appeared so different after Carlow's decision to play against the elements backfired, with Offaly racing 1-5 to nil in the first 12 minutes. Their eighth-minute goal came via Joe Bergin's one-handed flick to a Shane Kinsella delivery. 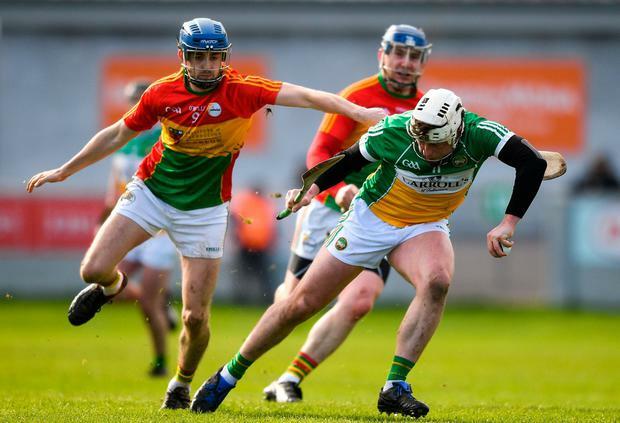 Things went from bad to worse for Carlow when, two minutes later, Byrne received a straight red, cited by a linesman for an apparent strike with the hurl after he had been fouled by Niall Houlihan, who also left the field through injury. When Shane Dooley blazed an inviting goal chance over the bar in the 18th minute, easing Offaly nine clear, it didn't seem a decisive moment. In retrospect, a second goal then might have made all the difference. Carlow trailed by 1-11 to 0-3, but Marty Kavanagh (who finished with 0-8) and Nolan (who shot 1-4, all from play) led the wind-backed onslaught. Kavanagh's 68th-minute free edged them ahead for the first time and John Michael Nolan doubled that advantage with what proved the winning point. Scorers - Carlow: M Kavanagh 0-8 (4f), C Nolan 1-4, S Murphy 1-1, JM Nolan 0-1. Offaly: J Bergin 1-7 (4f, 1 '65), S Dooley 0-3, S Kinsella, K Connolly 0-2 each, K Dunne, E Cahill (f) 0-1 each. 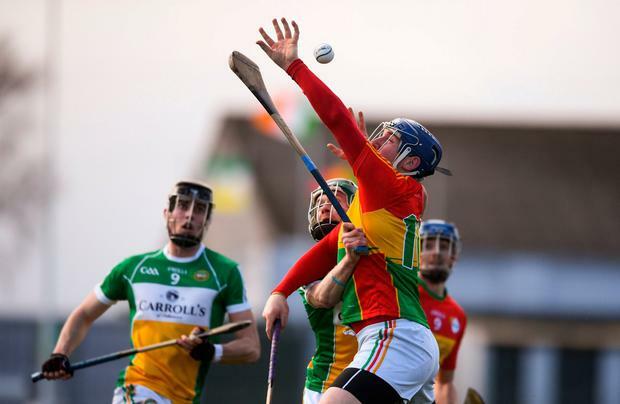 Carlow - B Tracey 7; M Doyle 7, P Doyle 6, A Corcoran 6; K McDonald 7, D English 7, R Coady 7; J Kavanagh 5, S Whelan 6; S Murphy 7, M Kavanagh 9, JM Nolan 6; C Nolan 9, E Byrne 4, J Doyle 5. Subs: J Murphy 6 for J Kavanagh (34), T Joyce 6 for J Doyle (60), J Nolan for J Murphy (66). Ref - J Keenan (Wicklow).